Gerry Cahill and Other Execs Talk "Economy"
What's the cruise industry's outlook given a weakening U.S. economy? 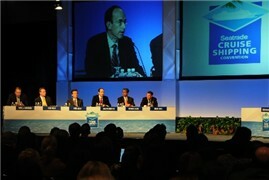 Cruise executives gave their perspective during a recent "State of the Industry" discussion at the 2008 Seatrade Cruise Shipping Convention in Miami Beach, FL. Gerry Cahill, president and CEO, Carnival Cruise Lines, gave the lead-off assessment, followed by insights from Royal Caribbean, Norwegian Cruise Line, MSC Cruises and Holland America executives. What's ahead?